The 8th Princess Louise (NB) Hussars or 8th Canadian Hussars (Princess Louise's) can trace its roots to 4 April 1848, when the New Brunswick Regiment of Yoemanry Calvary was formed. A more tenuous link exists, however, to 1775, when Lieutenant-Colonel John Saunders formed "Saunders Horse" to fight American rebels during the American Revolutionary War. This troop was probably disbanded in New Brunswick about 1783, the year that thousands of Loyalists or Americans who supported the British side during the revolution sailed for Nova Scotia. Many settled in the St. John River and Kennebecasis River valleys and elsewhere. In 1825, from among these disbanded troops, calvary units were formed, one being attached to each local infantry battalion. By 1848, 11 of these units joined together to form the New Brunswick Regiment of Yeomanry Cavalry. Over subsequent years the troops were reorganized several times. In 1884, Govenor General John Campbell's wife, Princess Louise, the eldest daughter of Queen Victoria, honoured the Regiment with her name, and it became the 8th Princess Louise's New Brunswick Regiment of Cavalry. The name changed, in 1892, to 8th Prince Louise's New Brunswick Hussars. During the World War I, the Hussars did not serve officially overseas. Instead, a Hussars squardron was supplied to the 6th Canadian Mounted Rifles and many individual members of the regiment joined other Canadian units serving overseas. During World War II, the Hussars served overseas as a formed unit, being stationed first in England, then North Africa, and finally in Italy. In 1940, the Hussars were formed into the 4th Canadian Motorcycle Regiment. The regiment moved from France to Belgium in 1945, and lastly to Holland where, at Delfziji, approximately 3,000 Axis troops surrendered to them. Returning to Canada, the 8th Princess Louise's New Brunswick Hussars reverted to reserve status. 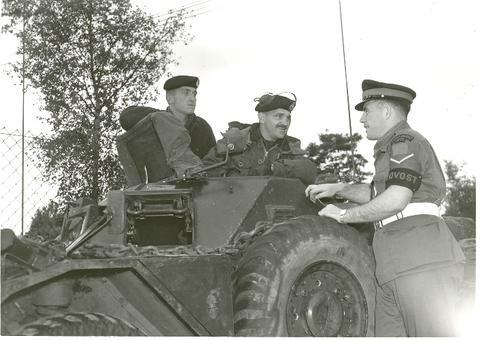 In the early 1950s, the regiment contributed men to "Y" troop, the special force that Canada sent to Korea, in 1951, to serve as part of NATO's brigade in Germany. In 1957, formation of the Regular Regiment bought a change in name, the regular regiment being designated the 8th Canadian Hussars (Princess Louise) and the Militia Regiment taking the same title with the word "militia" being added. The following year, the regiment's Reconnaissance Squadron left Canada to serve with the UN Expeditionary Force in Suez where it remained for a year. The regular regiment is now stationed at Camp Petawawa. Ontario. The militia remains in New Brunswick. After WWII, the 8th Princess Louise's reverted to a reserve regiment. In 1950, a number of personnel were provided to the Special Force which proceeded to Korea in May 1951. Early in 1957, when it was decided that a new regular armoured regiment should be formed, the honour was bestowed upon the 8th Princess Louise's NB Hussars as a result of their outstanding previous history. In 1958, part of the Regiment left Canada to serve with the United Nations Emergency Force in the Gaza Strip where it remained for a year. In 1959 the Hussars sailed to Germany for a three year tour of duty with the 4th Canadian Infantry Brigade. In 1963, when they returned from Germany, the Regiment took up residence in CFB Petawawa, and the Militia (Reserve) Regiment stayed at its home station in Moncton, New Brunswick. In 1964 the Hussars left the tanks and converted to a reconnaissance regiment. Series consists of materials on badges, uniforms and dress regulations. Included are hand written pages regarding belt buckles and changes to be made. Army Dress Committee Minutes from 1997 and illustrations of badges. Minutes from Dress Symposium December 1959 , A Pamphlet titled Regimental Orders of Dress dated 1965 and Flat badges and Shoulder Flash Information.